Heat the oven to 200C/180C fan/gas 6. Put the potatoes on a baking tray and roast in the oven for around 45 mins or until a knife inserts easily into the flesh. 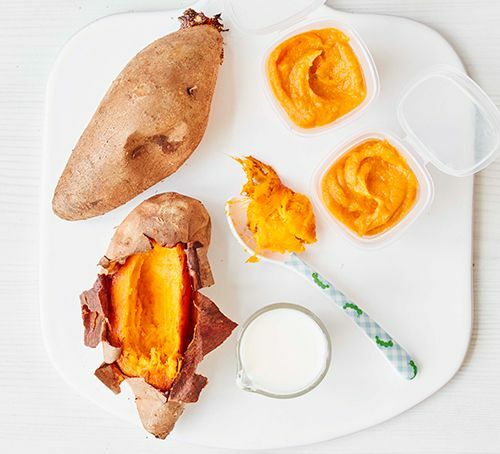 Allow to cool a little, carefully peel off the skin, removing any hard bits and blitz in a food processor, with a splash of baby’s milk, until smooth. You may need to scrape the sides of the bowl a few times to get a smooth consistency throughout. Serve one portion and divide the rest between small containers or ice cube trays and freeze.